In this tutorial you will learn to create a custom brush with which will allow you to create eye-catching border mask in Illustrator. 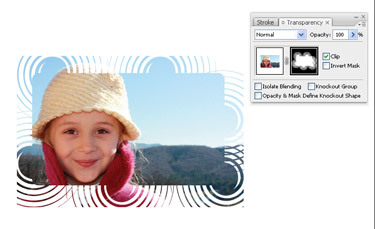 You can apply it to snaps or graphics without distorting the original image. 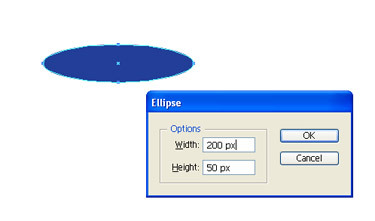 From the tool box select the Ellipse tool (L). On the artboard, click once. In the dialog box that appears enter 200 pt for Width, 50 pt for Height. Then click OK. Now on the artboard you will see an oval shape. In the tool bar, double click on the fill colour swatch to bring up the Colour Picker. Change the Fill colour to black and click OK. In the control panel, set the Stroke colour to none. From the Toolbox, pick the Twirl tool placed under the Wrap tool. 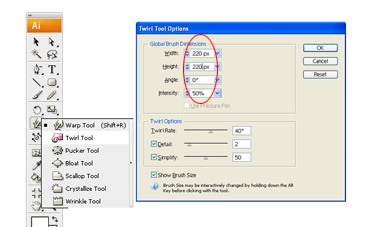 To bring up the Twirl Tool Options dialog, double click the tool itself. As for the size of the brush, we need to enter a size that is a bit larger than the object. (Here we entered 210 pt for both the Width and Height). Keep the Intensity to 50% and click OK.
Place the brush at the centre of the object (it should be a bit larger than the object). Click and hold the mouse. 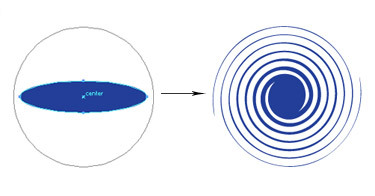 The object will transform to a twirl. Release the mousse as soon as you are satisfied with the result. Tip: After you start to twirl, hold the Option (PC: Alt) to reverse the direction of the twirl. Since we are applying this art using a custom brush, we have to make the object white so that it brings out the art in the mask. When you use the mask the black areas will hide the art and the white area will be revealed. Set the default Fill and Stroke colours black and white by pressing D. To remove the Stroke, click on go to the tool bar and click on the Stroke and then click ‘None’ icon below it. With the object still selected, go to the Window menu and choose Brushes. Click the flyout menu of the Brushes panel and pick New Brush from the menu. A dialog box of New Brush will appear. From it pick New Scatter Brush and click OK. Also Click OK in the Scatter Brush Options dialog that appears. We will change these settings later. 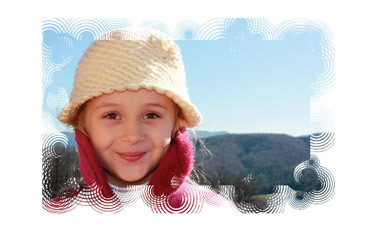 For masking the image with you new brush you need to place the graphic or photograph (File>Place). We have chosen an image with black background so that it contrasts with the white artboard. 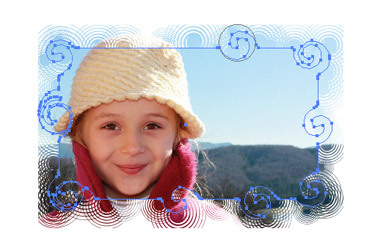 Depending on your image you can create colourful backgrounds. 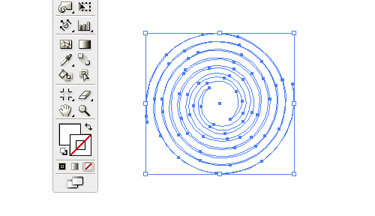 First, we need to draw the initial shape that you intent to mask in the image. Choose the Rectangle tool (M) from the tool box. Set the Fill to white and the Stroke to none. Create a box inside the photograph. Make sure that the box is approximately 25% smaller that the photograph. The area outside the box will be used to apply the custom brush for masking. 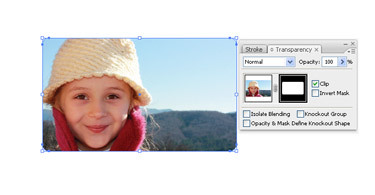 Select the Selection tool (V) and click both the image and the white box by holding Shift. Then go the Window menu and choose Transparency. 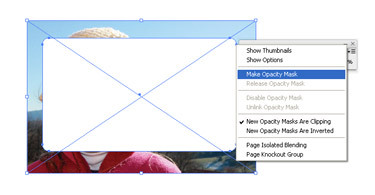 Click on the flyout menu of the Transparency panel and select Make Opacity Mask. Now, only the image in the white box will be visible. In the Transparency panel there are two thumbnails. 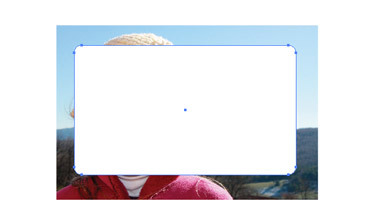 The thumbnail on the left represents the artboard area and the one on the right denotes the masked areas. The black outline that you see around the thumbnail indicates on which mode you are working on. By default, the artboard area is highlighted. To make it active, click on the mask thumbnail. Using the Selection tool select the mask shape. Open the Brushes panel. Click the thumbnail for the custom brush we created in Step 5 (it’s a blank thumbnail because the shape is filled with white). The brush will be applied with its default settings. 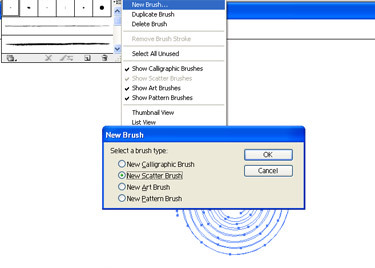 To open the Scatter Brush Options dialog double-click the brush thumbnail in the Brushes panel. Now we will make so changes to the Size, Spacing, and Scatter parameters. These changes will be updated immediately to your work of art. Feel free to experiment with different settings to achieve different results. The rectangle shape is still present. To change this, pick the Twirl tool from the Toolbox. Edge to distort the path (double-click the Twirl tool to change its size and to vary the effect) randomly click-and-hold to twirl areas around the box edge. By increasing the application area of brush effects, more shapes will be redrawn. 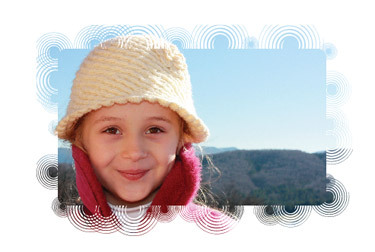 Continue it until you end up with a cool, stylized border that you can copy and paste to any other image.